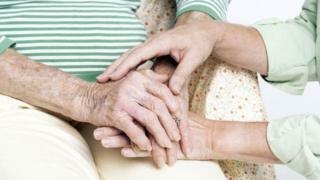 The dignity, heath and wellbeing of older people and those with disabilities in England are in danger, health and care groups warn. In a joint submission to the Treasury ahead of November's Spending Review, 20 organisations said the care sector was facing a "deepening crisis". They have called for funding to councils to be protected, as is happening with the NHS. Ministers said investment in health would also benefit the care sector. The government pointed out that plans were being put in place to ensure greater joint working between the two sectors that would relieve some of the pressures. However, the signatories of the submission, who include leaders of councils, the NHS, care providers and charities, said that they still feared for the future. The document said that the market was "fragile" with councils forced to freeze fees and providers exiting the sector. The submission said this was driving up prices for those who fund themselves and leading to fewer people getting state-funded support. While the government has pledged an extra £8bn a year for the NHS by 2020, social care has received no such assurances. Unlike the NHS, social care provided in an individual's home or in residential care is not free. Only the poorest get help. 1.3m older and disabled people received state-funded support last year - down by 500,000 in four years. The Local Government Association predicts if extra money is not put in there will be a shortfall of over £4bn in care services by 2020 - and that is before the implications of the national living wage are taken into account. An estimated 1.5m older people with care needs rely on family and friends for help. One in 10 older people face bills in excess of £100,000 over their lifetime for care. Ray James, president of the Association of Directors of Adult Social Services, one of the signatories to the submission, said: "It is vitally important that this year's Spending Review understands the importance of our services to vulnerable people. "The near-certainty is that without adequate and sustained finances our ability to carry out our will be in jeopardy." Frank Ursell, of the Care Providers Alliance, which was also involved in the submission, added that the challenges were on an "unprecedented scale". "Collectively, we deliver essential care to some of the most vulnerable people in society. "Doing nothing is simply not an option if this country is to honour its obligations to older people and adults of all ages with mental health problems and disabilities." Meanwhile, Rob Webster, chief executive of the NHS Confederation, which represents health service managers, said: "Having a shiny NHS cog will be no good in a broken health and care machine. "All these services are interconnected and all need greater financial certainty." But a Department of Health spokesman said the care sector would be benefitting from the extra investment in the NHS, adding "we are already getting NHS and councils working together to keep people well and living independently". In April the government launched the £5.3bn Better Care Fund, which is largely funded by the NHS, and is aimed at joint working between councils and the NHS.